Imaginative world building. Dynamic characters. Unexpected twists. 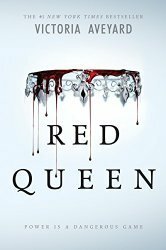 These snippets summarize Red Queen by Victoria Aveyard, Book One in the Red Queen series. SUMMARY from back: Graceling meets The Selection in debut novelist Victoria Aveyard’s sweeping tale of seventeen-year-old Mare, a common girl whose once-latent magical power draws her into the dangerous intrigue of the king’s palace. Will her power save her or condemn her? I have to begin by mentioning the imaginative world invented by Aveyard. She takes us from the Stilts, slums where red blood folks live in abject poverty, to a castle made with unbreakable, diamondglass walls that is the captial of Silver life. The contract couldn’t be clearer. While Reds have seen the amazing powers demonstrated by a few Silvers, what Reds don’t know is that Silvers with powers they could never fathom exist–fireburners, telkies, folks who can become invisible, beings who take the form of shadows and can bend light, Oblivions who can explode things with a touch, Storms who control the weather, others who can bend metal to their will, and more. The variety of powers adds an interesting dynamic to the world and I’ll be very curious to see how Aveyard develops this in the next book in the series. I thought the author brought forth the three main characters with a lot of depth. The central protaginist, Mare Barrow, demonstrated herself to be a strong heroine. It’s clear she will do whatever it takes, including sacrifice her own life, to upset the uneasy imbalance of power between Red and Silver. She has a conflict before her that is significant and had me cheering her success! And then there’s the two princes, Cal and Maven who have different mothers, setting up conflict, not only with the pecking order, but inner conflict as well. Cal, while the eldest, is the dutiful son, groomed for the monarchy who also holds a role as general, commanding the armies of the nation. Maven, the younger, is his mother, the queen’s, favorite and must navigate this family dynamic…and boy does he. I won’t give away any spoilers, but let’s just say this produces a huge plot twist that you won’t want to miss. All told, I give this book 4 out of 5 stars. I also invite you to download the free ebooks of the Prequel and Book one in the Andy Smithson epic fantasy series. Links are along the right side of this page. A good, compact review. Covers the story premise well. Thanks so much. Have you read Red Queen as well? Although I haven’t read the novel I agree with your comment about series. It can be a difficult call to know how and how much information is sufficient but not boring. Great insight 🙂 We all write so our familiarity has us believe writing is easy. Oh contraire, writing is not easy and with every book I read these days, I observe exactly the struggle you speak to. The authors that get just the right balance are amazing and well deserving of the recognition they receive. Thanks for your insight. Also, thanks for the reminder about the Andy Smithson series. I had book 1, but I hadn’t downloaded the prequel.